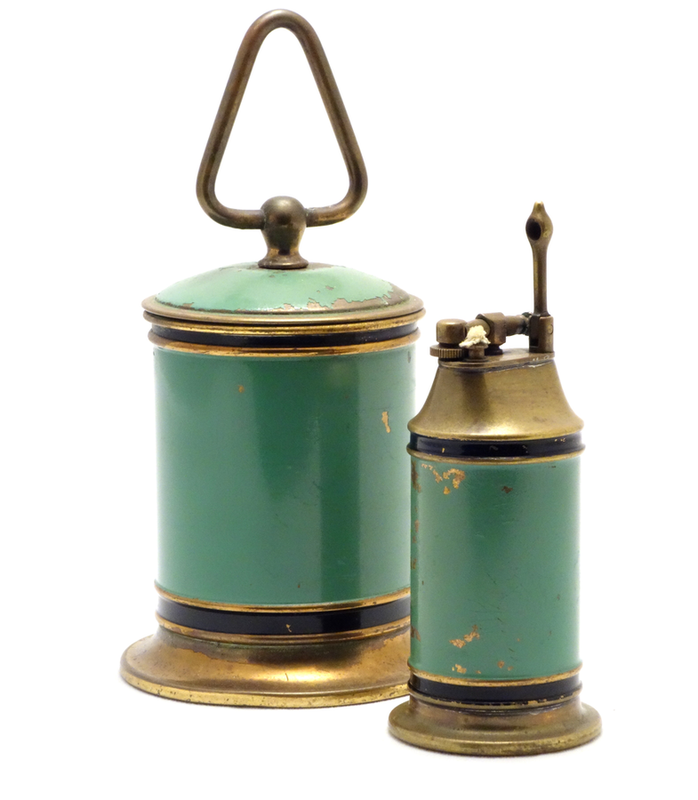 This stylish Art Deco Lift Arm Table Lighter Set was manufactured between 1933 and 1939 by Park Sherman Company in Springfield, Illinois, USA. This particular set consists of a wick lighter and a cigarette holder/dispenser. 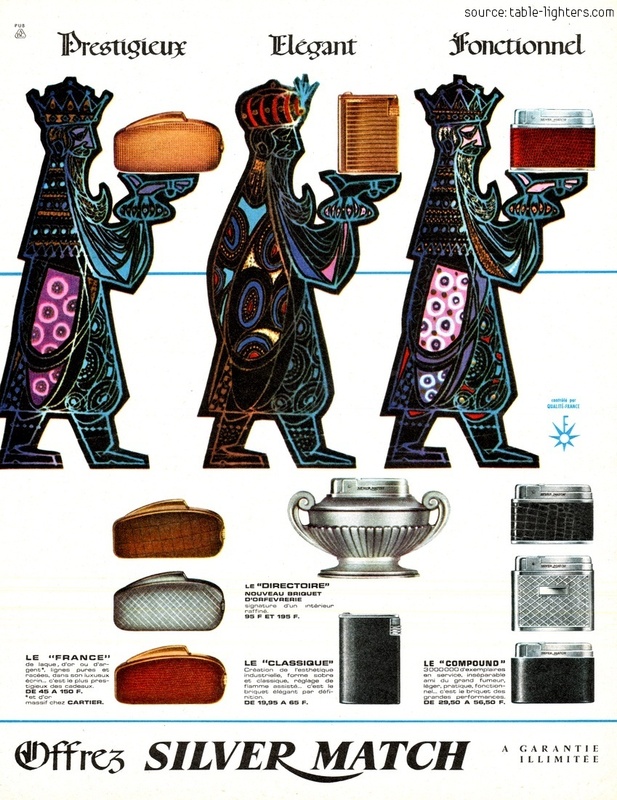 It was also available with a matching tray and several brass ashtrays. The most common colors for this set is green with black stripes, red with black stripes and black with red stripes. The Park Sherman products were sold throughout 1931 to the 1960 when it was sold to a New Jersey firm of Ketcham & McDougall. Park Sherman lighters were marketed as "Park", "Storm King" and "Everdry". 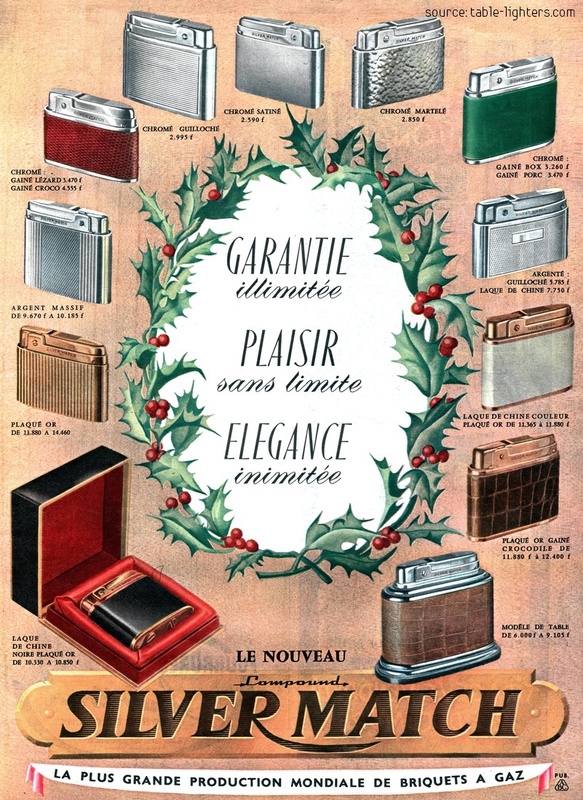 This full page color advertisement was published in a French magazine in 1957. It present the all new Silver Match gas lighters in different finishes. 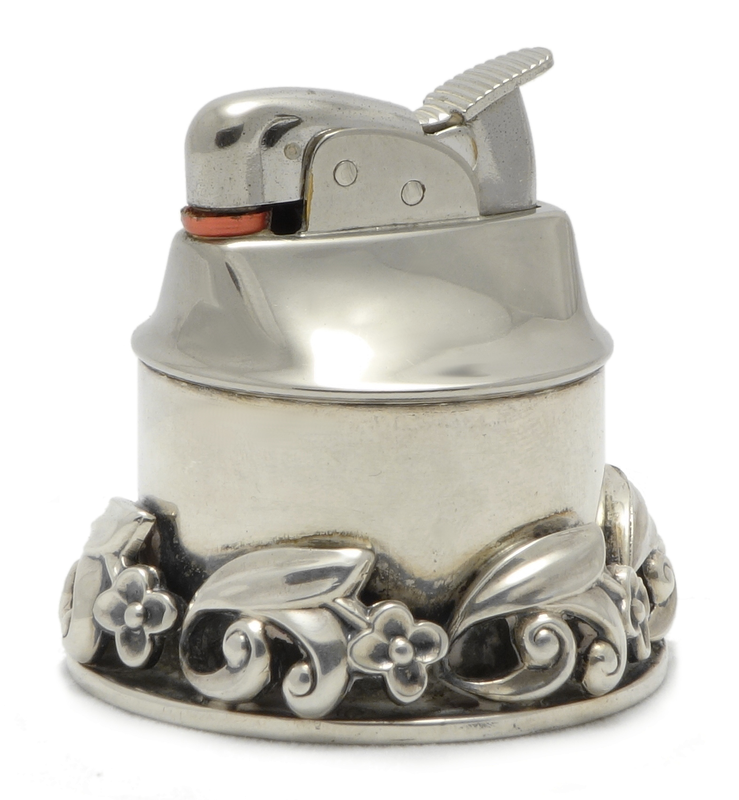 This rare and finely crafted table lighter was manufactured by International Silver Co. and Evans between 1953 and 1955 in Meriden, Connecticut, USA. The base of the lighter is made of sterling silver and is not weighted. It is round with famous for the Danish design and Alphonse La Paglia modern band of scrolls and flowers decoration. The design of this piece is reminiscent of work by George Jensen, a renowned Danish silversmith; however, this is not surprising as La Paglia studied under Jensen in the 1930's and, after moving to the US in the 1940's, continued as a designer under Frederick Lunning (Georg Jensen U.S.A.). In 1952, La Paglia established a close relationship with International Silver Company, and moved his studio to Meriden, Connecticut, where he worked until his untimely death in 1953. A. La Paglia worked also for Black Starr and Gorham. The lighter was available in different heights: 2–2.5". This figural wick lighter was manufactured by Negbaur between 1940 and 1949 in Allbright, New York in the United States. It is made of die cast metal in a dark cooper antique (uncommon) or chrome plate finish (rare). The two carriage wheels spin on their axle and the carriage elevates up and down. 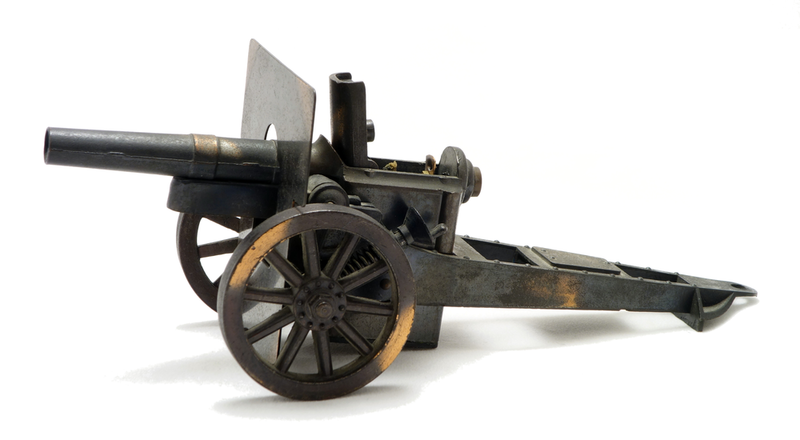 It presents a reproduction of a 75mm field canon gun. 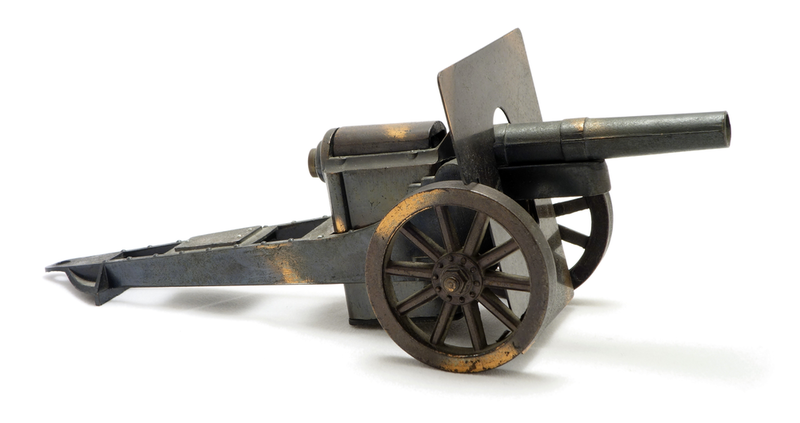 This quick-firing artillery piece is simply called "Canon de 75 modèle 1897". It was in service in several countries since 1898 and used during both World Wars among others by France, United States, Poland, Belgium, Germany and United Kingdom. The semi-automatic wick lighter is removable from the canon base. In order to lit the lighter one need to press the button in the back of the cannon barrel. The top opens and the wick burns. Negbaur was well known for their other solid built figural lighters, like planes, knights, golf bags, chess figures or planes made in the earlier years (1930s and 1940s). The Canon Lighter is very collectible as it is well build and designed. As many of them were manufactured it is not a problem to find one in excellent condition. 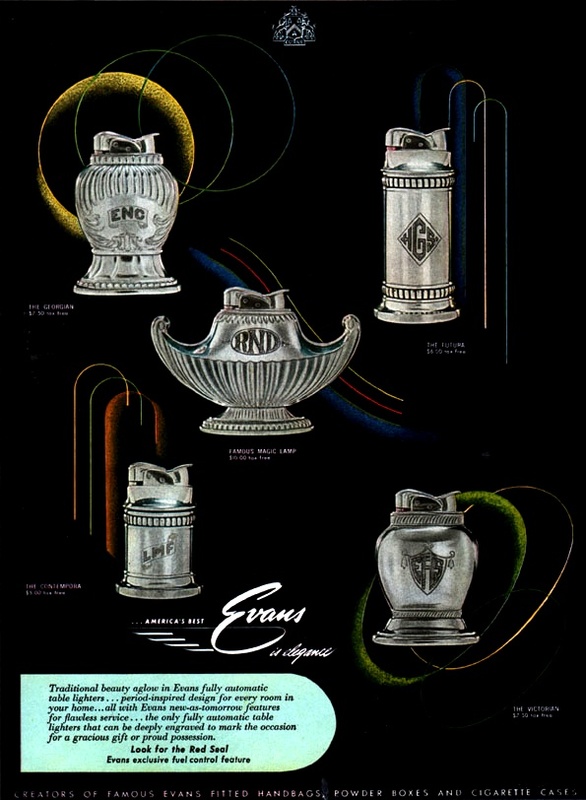 This flint cigarette lighter was also manufactured for Demley with a small alteration – an added metal base for example. 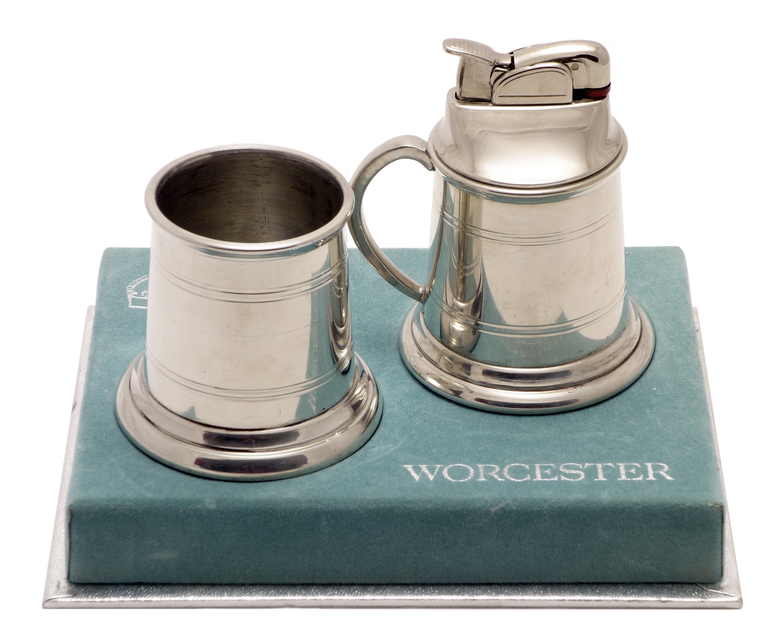 The Worcester English Pewter Table Lighter Set was marketed by Worcester Silver Co. and made in 1951 in Sheffield, England. The set consists of a silver plated wick lighter shaped of tankard and matching cigarette holder.